My research focuses on physically-based simulations of fluids and deformable bodies in computer graphics and their perceptual evaluations. Recently, I am also researching into machine learning techniques such as neural networks and deep learning for such simulations. I have been working as a postdoc in Nils Thuerey’s group at the Technical University of Munich since 2015. 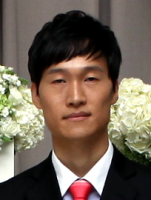 I earned my Ph.D. in computer science and engineering from Korea University in February 2014, where my advisor was JungHyun Han. I obtained my M.Sc. degree from the same university in February 2008. Kiwon Um, Xiangyu Hu, and Nils Thuerey, “Analysis of Free Surface Simulation using Breaking-dam Benchmark,” Proceedings of the 11th International SPHERIC Workshop, June 13–16, 2016, Munich, Germany, pp. 410-415. Seungho Baek, Kiwon Um, and JungHyun Han, “Muddy Water Animation with Different Details,” Computer Animation and Virtual Worlds (the 28th International Conference on Computer Animation and Social Agents, May 11-13, 2015, Singapore), Vol. 26, No. 3-4, pp. 347-355. Wonbae Yoon, Namil Lee, Kiwon Um, and JungHyun Han, “Computer-generated Iron Filing Art,” The Visual Computer (the 31st Computer Graphics International, June 10-13, 2014, Sydney, Australia), Vol. 30, No. 6-8, pp. 889-895. Kiwon Um and JungHyun Han, “Leaking Fluids,” Proceedings of International Symposium on Visual Computing, December 1-3, 2008, Las Vegas, Nevada, USA, pp. 1135-1143.